According to Digital Enterprise Journal over 70 percent of the operational data available to IT Ops teams is not actionable. The mandate for IT operations to continually deliver a resilient and fulfilling digital experience is at an all-time high. Faced with increasing pressures from customers and competitors alike, organizations are turning to Artificial Intelligence for IT Operations (AIOps) in the hopes of achieving greater agility. But to fuel the transition, they need high-quality data. 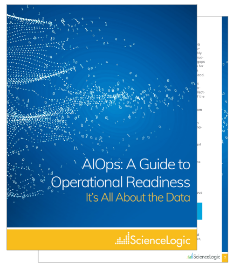 This whitepaper is an operational guide with five key steps designed to ensure that IT Ops teams can maximize their AIOps investment by using operational data that is accurate, timely, clean and contextualized. Download now to learn more and begin to deliver on the promise of AIOps.